Build an ebb and flow hydroponic system! The plants are grown in rockwool blocks or small pots filled with Hydrocorn. A system like this works best for plants smaller than 24 inches tall. The nutrient solution is stored in the reservoir and is pumped up to the tray with a submersible pump through the fill/drain fitting. The pump is controlled with a timer that turns on a few times per day. Or enough to keep the growing media moist all the time. The pump only needs to run long enough to reach the top of the overflow fitting. When the pump turns off the solution flows back down the fill/drain fitting and out the pump. The amount of solution that goes into the tray is controlled by the overflow fitting. Ebb and flow is one of the most reliable and easy to build hydroponic systems. * The pump needs to be b enough to lift the water to the to tray but not too b or you will have a fountain! Most pumps have a measurement of how high they will pump. It is measured in HEAD. If a pump is rated at four feet of head, that's how high it will pump. Some pumps only have a rating in PSI (Pounds per Square Inch). To find the HEAD, multiply the PSI by 2.31. In most cases, you want a pump with a head rating of twice the height that you need to lift the water. The tray must be above the reservoir so when the pump turns off, the water will flow back down through the pump. 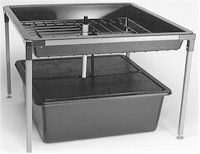 You can place the tray directly on top of the reservoir or make a stand for the tray and put the reservoir underneath. The Fill / Drain and Overflow fittings fit in a 1 inch hole. Some of our trays are drilled and come with the fittings. Install the fittings and connect the pump with a 1/2 inch I.D. tube. The overflow fitting may need to be extended below with a piece of 3/4 inch PVC pipe. The overflow fitting may need to be adjusted. The tray should only flood to about 80 percent of the height of the growing medium. If you are using rockwool cubes, it should flood about 2 inches. You may need to add or remove PVC pipe on the top too. Test this before filling the tray with growing media. I prefer not to use a screen on overflow fittings. All the leaves that drop collect around the screen and changes the flood depth. The more debris around the screen, the higher the water goes. If the water floods too deep, the growing medium will float and your plants tip over. Or even worse, the tray might overflow! You'll need to add nutrient. General Hydroponics Flora is the preferred nutrient. A set of pints will last about 2 months for a 25 gallon reservoir. Follow the instructions on the bottle. After the nutrient you may need to adjust the pH. A simple thing to do that doesn't cost a lot and your plants will grow much better! Get a pH test kit and some pH down, just a quart, this is b stuff and will last a long time. The pH almost always needs to be lowered. 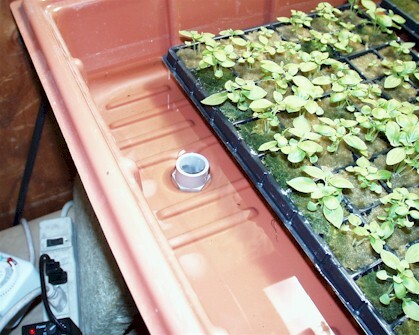 In the photo above I'm using 1.4" rockwool cubes to start some basil seeds in a small tray but you want to use larger blocks, just put the blocks right in the tray.